Today I join the ranks of those working standing up. Inspired by this Ikea hack standing desk, I fashioned a similar one. (Specifications below.) Here is another standing desk option that isn’t as elegant and takes up more space, but the white pulls it all together. I managed to create the solution you see above for under $200. A rash of articles like this and this made the rounds about the health hazards of sitting too long. Little by little I’d hear of friends working at standing desks. As a designer who logs long hours at a computer, I needed a more sustainable option to sitting all day. When I cook, which is often, I feel alert and energetic. Occasionally I’ll prop my laptop on a stack of books on the kitchen counter to write or do other work that doesn’t require my big screen. I feel less trapped and more likely to move and stretch. And after sleeping for eight hours, sitting down isn’t the first thing I want to do in the morning. I was impatient to hurry up and stand up, but I did do some research and found few good options. Most desks were very expensive or decidedly unsexy, like some kind of surgeon’s cart. Even with Ikea’s good variety of table top and leg options, there are only two telescoping legs. Vika Byske goes to 42″ but they’re not stable enough to use four together. Instead, one would use two legs with the other side of the table top hinged to the wall. The other legs, Vika Kaj, only go to just over 35″. Most of us need need to work in the 40″ (plus) range. I’m 5’4″ and my desk measures 40″. The key measurement is from the floor to your elbow. You want your arms at a 90-degree angle when you work. The frame I’m using is Utby Underframe, a brushed stainless steel sturdy frame meant as a kitchen island table that’s 35 3/8″ tall. They discontinued the 42″ tall frame so this required more height. A surprisingly elegant solution was to create more height using Capita legs (detail at left). These come in 2″, 4″ and 6″ tall. This required two table tops. Shown is Vika Furuskog, an unfinished solid wood that I can varnish or paint. The table tops vary in thickness so make sure you do the math to achieve the right overall height if you’re hobbling together a solution. For added keyboard height, this hack used Ekby Alex shelf. Your monitor is another issue. As you can see, I’m using a stack of books to test the height. Your eye should be in line with the upper third of your screen so you can gaze down a bit. Another set of 4″ Capita legs and a small pine shelf should do the trick for me. I love the gap between the two tops for storing papers, tools or other objects. A found piece of wood on the bottom cross bar of the frame holds my printer. I didn’t even bother screwing the table tops on, saving me a good bit of effort. For a hobbled-t0gether solution, I’m happy with the open, airy result. I have an additional work space next to this one that I can use if I need to sit down. But the next addition might be a tall adjustable stool. Do you work at a standing desk? Do you like it? Where did you get your desk? How to Decide What a Logo Is Worth to You? I switched to a standing desk for the same reasons. I work in a corner cubicle, that is a cubicle with only two walls and the desk is bolted to the cubicle walls. I bought a $30 Billy shelf extension for the wireless keyboard and mouse, propped the computer on two paper boxes and an old step stool to have the screen at eye level and that’s it (our Assistant CEO made his own laptop stand at his home shop). I covered the laptop stand with a nice cloth. I did have to buy the wireless keyboard. I also recommend a foam pad to stand on, the thicker the better. It looks weird, but I believe I saved my nonprofit hundreds of dollars by this hack (the cheapest Aeron standing desk solution I saw is close to $3K). And it’s a great conversation starter. I take breaks from standing – I simply move the items around and sit at a chair. My legs used to hurt when I first started standing, but then they got used to it. I do find that my concentration is better while sitting, which is why I sit down when I have to write something creative or lengthy. Everything else I do standing, including typing this comment. Even hackier! I thought you were going to say that when your CEO saw your stacked boxes, they broke down and bought you something better : ) Thanks for sharing your story. I thought about the foam pad. I’m sure I’ll need one but have had my eye on some FLOR carpet tiles that are more for looks than function. For now, I’m standing in running shoes. I notice my calves are tight. So it’s good to know this might pass. He only saw the stacked boxes in the test stage. I put a huge TEST sign on the setup. Then I covered the whole thing up with the unused shower curtain. I want a jumpy thing! Why do they take these away when you turn 1? A shower curtain, hmmm. I’m sure you’ve made it look good. I loved my Jolly Jumper and was so jealous when I could no longer use it but the baby sister who came along could….Weird that I remember what the thing was called – guess it really made a serious impression. Are the Capita legs fixed to the bottom table top somehow? Or is it stable enough just free-standing? The just sit on the bottom-most later but they can screw in under the top-most layer. I know someone else who stacked cardboard boxes, Natalie. Not that weird : ) Those desks are cool. The design is much better than I’ve seen. Thanks for the link. And for reading! 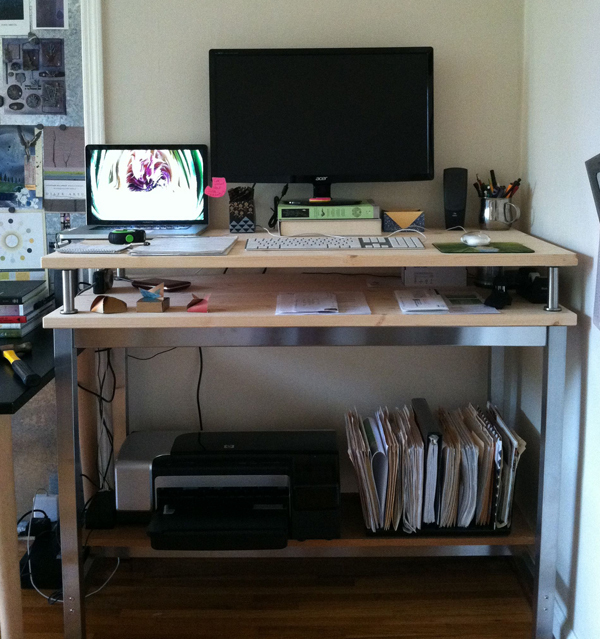 I remembered your blog post and I’m wondering, how are you liking the standing desk now? Has your body adjusted? Do you prefer it or are you doing it because you know it’s better for you? Do you wear running shoes to support your legs? I’m looking around my office and wondering how I could set that up. How do you move back and forth between standing/sitting? Is that hard with the computer/cords/etc? 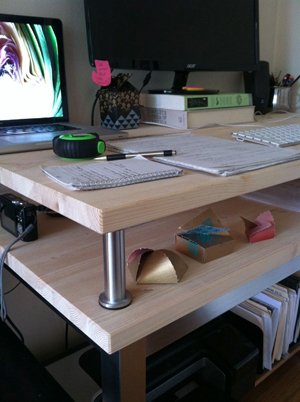 I feel like I would need a sitting desk as a security blanket – plus I really like my desk! I might try hacking a bit with short shelves and so on but I’ve got two monitors, phone, external drives, etc. – seems like it might be an all or nothing proposition. And did you get a tall stool? Do you like that? Does it bug you to not have a back? How is that ergonomically? And in case this isn’t enough questions – am I losing my mind or is it snowing here in your blog? Feel free to hit me via email if you prefer! Ha! Yes, I guess it’s December and I have a little snowy plug-in enabled. I forgot about that. All good questions. As I write this, I am sitting in the “sunnier” window of the living room. But in general, I do really stand all day. At first, my heels and calves ached a bit. I wear sneakers and should get one of of those pads like chefs use to stand on. I do sit down even for long stretches when I’m writing or doing internet research. I work on my laptop, which I can easily unplug from my big monitor. It sounds like your setup is a more cumbersome? I have a long table with a chair next to the standup desk. That way I can move over and sit down. I haven’t gotten a stool yet but I was thinking about it except it might make me inclined to sit. Instead, I reserve standing time for when I really need the big monitor and sit when I don’t. I don’t think it has cured my low back pain, which obviously wasn’t from sitting! But in general, what I like is that I feel much more engaged and raring to go. I had this dread feeling of sitting down. Standing up makes me more alert and focused for some reason. Or maybe my projects are just more interesting right now! Great to hear you’re digging it, Jane. I just hacked my way to standing for the day using stuff I had around the office. Pretty interesting! I think I’ll give this a go for a week and see whether I might want to make it permanent. I would definitely need something to stand on. I’m looking at this for inexpensive: http://www.gelpro.com/shop/clearance-center. I already get what you mean about feeling more engaged. And I think my spine just breathed a sigh of relief.